The Wolfberry Post! focuses on recent news and information relevant to the Permian Basin and the Wolfberry and Cline Shale formations in Texas as well as information relating to the oil and gas sector. 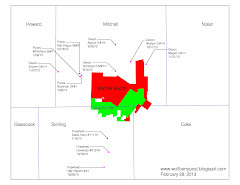 Lynden Energy Corp. posted a new Investor Presentation to their website (click here). Click here for larger version of map. Lynden Energy Corp. Valuation Analysis (click here) or see 10/31/11 post. Please feel free to contact us at wolfberrypost@gmail.com. Disclosure: I am long LVLEF. This blog contains stock ideas and information and does not make recommendations. The intent of this blog is to provide information for discussion and informational purposes and should not be considered to be investment advice. Please complete your own due diligence.